ROSEBURG'S SHEATHING PANELS ARE ESPECIALLY DESIGNED FOR ENGINEERED APPLICATIONS SUCH AS STRUCTURAL COMPONENTS WHERE DESIGN PROPERTIES INCLUDING TENSION, COMPRESSION, SHEAR, CROSS-PANEL FLEXURAL PROPERTIES AND NAIL HOLDING AND BEARING ARE OF SIGNIFICANT IMPORTANCE. SHEATHING IS MANUFACTURED ACCORDING TO GRADE, VENEER, AND PANEL THICKNESS, CONSTRUCTION, WORKMANSHIP, AND IDENTIFICATION REQUIREMENTS FOR PLYWOOD SHEATHING AS OUTLINED IN THE PS 1-09. SUB-WALL / ROOF FOUNDATION FOR HOME WRAP VAPOR BARRIER AND THE MOST COMMON SIDING MATERIAL TO BE APPLIED RIGHT OVER IT. FACE : A LAYER OF WESTERN SOFTWOOD VENEER THAT HAS NOT BEEN FACTORY SANDED. IT HAS LIMITED PITCH POCKETS, OPEN SPLITS, AND OTHER OPEN CHARACTERISTICS BUT THESE DO NOT COMPROMISE THE STRENGTH AND DURABILITY ON THE PANEL. SHEATHING SHOULD BE SECURELY FASTENED WITH 6D NAILS ON 1/4", 3/8", 1/2" PANELS AND 8D NAILS ON 5/8", 3/4", 1" PANELS . SPACE NAILS 6" O.C. AROUND ALL PANEL EDGES AND 12" O.C. ON INTERMEDIATE SUPPORTS. FOR SOFFIT APPLICATIONS ALL PANEL EDGES SHOULD BE SUPPORTED. NAILS SHOULD PENETRATE AT LEAST 1" INTO THE SUBSTRATE MATERIAL. LEAVE 1/8" GAP BETWEEN PANEL EDGES. SPIRAL OR RING SHANK OFFER THE BEST HOLDING POWER. SCREWS AND BOLTS CAN ALSO BE USED. AraucoPly® Sanded Panels are finished with 150-grit sandpaper on the face and 120-grit sandpaper on the back, facilitating easy finishing with excellent results. All grade-stamped AraucoPly® Sanded Panels are manufactured in accordance with the US PS 1-09 product standard, and all ACX and BCX products are PS1-09 underlayment compliant and are edge stamped as such by TECO. Stable composed core with mínimum voids. Small, wood-based putty repairs are allowed. All type of repairs are accepted. Open defects are not accepted. Base panel for high-pressure lamination. Note: The allowable spans were determined using a dead load of 10 psf. If the dead load exceeds 10 psf then the live load shall be reduced accordingly. To consider this data, panels shall be a minimum of 24 inches (600mm.) wide. 11/32” (9mm) and 15/32” (12mm) span rated siding products available with plain (no groove) or shallow groove patterns only. 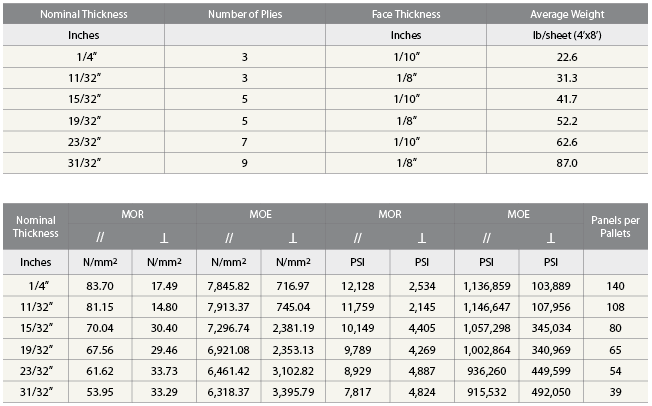 19/32” (15mm) siding wall span ratings apply to panels with the following surface treatments: Plain (no groove), 4”OC / 8”OC shallow groove and 4”OC / 8”OC deep groove patterns only. All AraucoPly® panels are laid up with phenolic WBP glue which is suitable for exterior use. This glue complies with European standard EN 314. Formaldehyde emission is 0.02 mg/L, which meets E1 emission regulations. DURAGUARD MDO PLYWOOD IS PERFECT FOR RESIDENTIAL AND COMMERCIAL INTERIOR AND EXTERIOR CONSTRUCTION BECAUSE IT'S STRONGER, MORE RIGID, AND DURABLE THAN COMPOSITION PRODUCTS AND IS EASY TO FINISH AND MAINTAIN. USING ORDINARY TOOLS FOUND ON ANY JOBSITE, IT CAN EASILY BE CUT AND SHAPED FOR NUMEROUS APPLICATIONS. DURAGUARD MDO IS PRODUCED WITH A HIGH-QUALITY THERMOSETTING RESIN-IMPREGNATED FIBER SURFACE BONDED TO ONE OR BOTH SIDES UNDER HEAT AND PRESSURE TO OUR OWN EXTERIOR GRADE PLYWOOD PANEL.